Please visit the Oxford Historical Society booth at the Recreation and Leisure Fair from 1pm until 4pm. The event is held at the Cowan Park Sports Complex, 895 Ridgewood Dr., Woodstock, ON. Also, see all the other free-time activities available in and around Woodstock. Please join us for a special evening presentation marking the centenary of WWI, hosted jointly by the Oxford Historical Society and the Woodstock Museum, NHS. Rebecca Beausaert, PhD, will present “Your King and Country Need You! 1914 Oxford Goes to War”. This is the 2nd of 5 Oxford Historical Society annual presentations marking the centenary of WW1. This is event is jointly hosted by the Woodstock Museum, NHS, and will be held upstairs in the museum. All are welcome to attend. Light refreshments will be provided after the talk. 9:30am-4pm at the Woodstock Museum, NHS. Learn the art of asking questions with Dr. Elaine Becker. Have you been looking into your family or local history, using research skills & exploring how to best preserve them? This interactive experience will examine research styles, interviewing techniques, record keeping, writing for publication & give hands on experience with interviewing. The Woodstock Museum may invite you to help gather stories for future exhibits. To sign up for this event please contact the Woodstock Museum, NHS. Please join the OxHS in welcoming Matthew Scholtz to discuss his latest book: Tillsonburg Album. This event will take place at the Woodstock Public Library, 445 Hunter St. at 7pm. To purchase Matthew’s book please visit his website Tillsonburg Album. Deward Yates, a Oxford Historical Society member and teacher of history at local senior centres, invites all members and friends of the Society to join him on a day trip to Elgin County and the St. Thomas area. This year’s trip includes a train ride on the heritage railway from Port Stanley to St. Thomas, with a step-on tour provided by the Elgin Historical Society. The cost for the trip is $120.00/per person ($15 less if you bring your own lunch). This day trip is not organized by the OxHS so please contact Deward Yates directly at 519-539-3530 to participate. Please see the attached PDF Elgin County Trip for more information. Please join us for a special meeting hosted by the Woodstock Art Gallery (WAG). 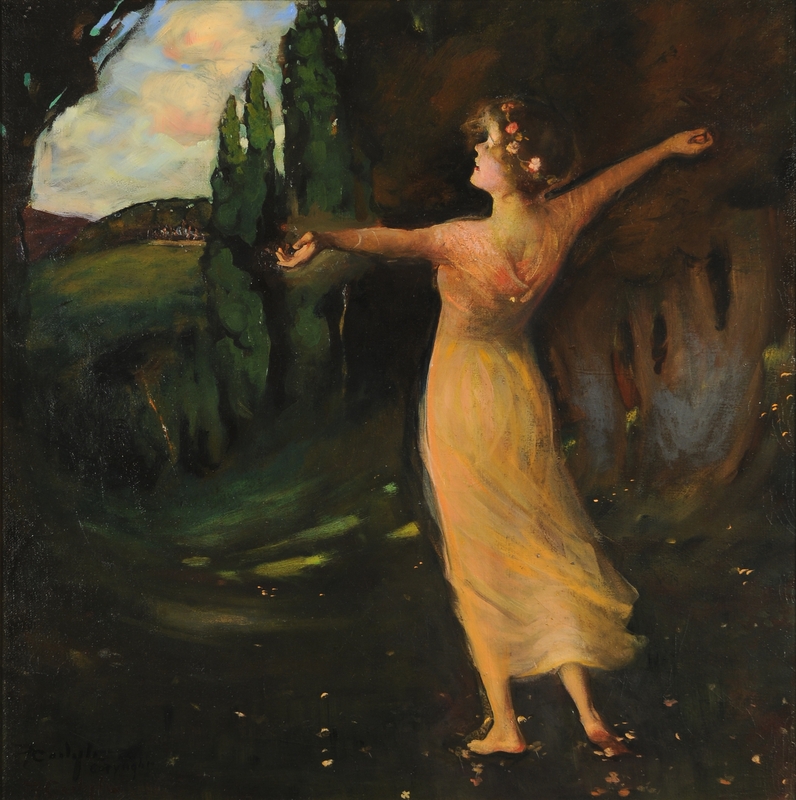 At this event Mary Reid, Director/Curator of the WAG presents an illustrated talk on Woodstock’s most notable historical Canadian artist, Florence Carlyle, affectionately called ‘Bird’, by those who knew her. Please join us for a Grand Day Out in downtown Simcoe. This year’s annual outing we will visit the Eva Brook Donly Museum, have lunch at the Blue Elephant, then tour the Carillon Tower and have a chance to ring the bells. If time permits we will also visit the Delhi Tobacco Museum & Heritage Centre before heading back to Woodstock. Please open the attached Grand Day Out June 20, 2015, for more information about the places, times and fees. Registration for this event closes Saturday, June 13, 2015. A new book by Dr. Elaine Becker, commemorating the 150th Anniversary of the Woodstock Fire Department. Defined Under Pressure is available for $15.00 (taxes included), at one of the following locations: the Resource Centre of the Oxford Historical Society, the Parkinson Road Fire Station, and the Woodstock Museum NHS. Please also visit the exhibit at the Woodstock Museum NHS, which runs from June 6 to September 5th. Thursday, July 30th from 1-3pm at the Downtown Farmer’s Market. Sunday, August 9th at 11am and at 1pm in the Grand Hall of the Woodstock Museum, NHS. Fun With Firetrucks! Please visit Museum Square on Sunday, Aug. 9th , from 10am to 3pm to view vintage firetrucks. 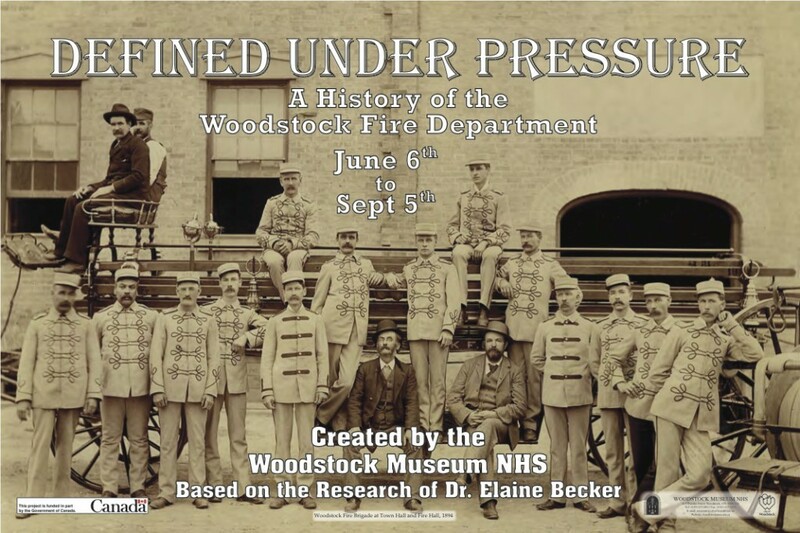 See the special exhibit inside the Museum where Dr. Elaine Becker will be speaking about her new book: Defined Under Pressure: A History of the Woodstock Fire Department, at 11am and at 1pm. Books can be purchased for $15.00 (taxes included) from the Oxford Historical Society, the Parkinson Road Fire Station, or from the Woodstock Museum, NHS. You are cordially invited to celebrate an Historic Reign at Old St. Paul’s Church. In cooperation with the Monarchist League of Canada, the Church is celebrating the reign of Queen Elizabeth II on Wed. Sep. 9th 2015, when she will become the longest reigning monarch in British History. The Church Tower Bells will ring 64 times at 12 noon on Sep. 9th, to commemorate the date that she will have reigned 1 day longer than Queen Victoria. The Community of Woodstock is welcome to come to Old St. Paul’s to view the Royal Display and enjoy a cup of tea, with strawberry jam and tea biscuits any time from 11:30am to 2:30pm. We would like as many citizens of Woodstock as possible to sign the card which will be sent to the Queen. 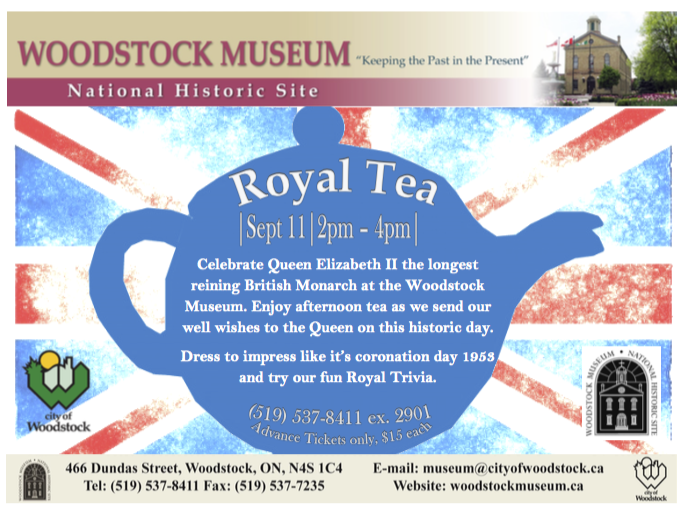 Celebrate Queen Elizabeth II the longest reigning British Monarch at the Woodstock Museum, NHS. Enjoy afternoon tea as we send our well wishes to the Queen on this historic day. Dress to impress like it’s coronation day 1953 and try our fun Royal Trivia.Advance tickets only, $15 each. For tickets call 519-537-8411 ext. 2901. The Oxford Historical Society invites everyone to attend this year’s joint meeting with the OGSOxford Country, at the Southgate Centre. Dr. Elaine Becker will be presenting her book: Defined Under Pressure: the Story of the Woodstock Fire Department. For more information please see the attached PDF: Annual Joint Dinner Meeting 2015 Bar opens at 6pm, dinner at 6:30pm. Tickets are available for $25.00 per person, and must be purchased in advance from the Society, call 519-421-1700 or email info@oxfordhistoricalsociety.ca. Our guest speaker for this evening will be Laurel Beechey. Laurel will be discussing the history of the Pioneer Graveyard and how to research a family from a date on a tombstone, and will also describe some “Tombstone Tales”. She will expand upon Prof. Bird the Black Barber on Broadway, the unusual Rutherford family, drownings, burnings and more. A very lively and scary talk for the Hallowe’en month. This talk will take place at 7pm at the Woodstock Public Library. Oxford Creates 2015 will be held the weekend of November 14th – 15th. This is a fine art show and sale featuring 35 artists, 25 authors and live music. The Oxford Historical Society will be there promoting the area’s history and selling books by various local authors. Saturday’s hours are from 10am-4pm, Sunday’s hours are from noon-4pm. The event is free and will be held at the Oxford Golf & Country Club, formerly the Craigowan Golf & Country Club. Bryan and Shannon Prince will present their talk on Bryan’s latest book “My Brother’s Keeper: African Canadians and the American Civil War”. This book tells the story of the Blacks who came into Canada, and who later returned to the States to fight for the Union cause during the American Civil War. Please click on the link to learn more about Bryan Prince and his work. Shannon Prince is the curator of the Buxton Museum, NHS in North Buxton. This talk is co-sponsored with the Woodstock Public Library, and will be held on the Library’s 2nd floor at 7pm. Space is limited and tickets must be picked up in advance from the Library. This is a free event.